Do mobile devices belong in the classroom? Bethel Middle school in Waynesville, North Carolina, took the bold step last month of banning smartphones in class, from start of day until final bell. Administrators said the devices cause distractions that prevent students from learning. Last September, school districts across Wisconsin also banned cell phones in the classroom in an effort to reduce distractions. Portage High School confiscated more than 200 phones during the past school year, and classroom performance improved, Principal Robin Kvalo says. Monte Del Sol Charter School in Santa Fe, New Mexico, has had a cell phone ban since 2016. Teachers, parents and students say that since the ban went into effect, students are more focused in class and even talk to one another at lunchtime. A bill that would limit smartphone use in Utah classrooms was introduced last month by Utah’s House Education Committee. But it’s not just the U.S. Last fall, the French Parliament enacted legislation that banned students up to age 15 from taking the devices to school—or, at the very least, requiring that they be turned off during class. British education leaders were considering a similar move as of last month. They have pointed to a London School of Economics study that found banning phones in schools resulted in a 6 percent rise in test scores. The first of what we know of today as smartphones began appearing in 2007 with the Apple iPhone, followed by Android devices in 2008. By the end of the decade, smartphones quickly became ubiquitous. These days, nearly 70 percent of high school students and 25 percent of middle schoolers have their own phones and use them daily. The same applies to college students. One study found that 95 percent of students bring their phones to class every day, 92 percent use their phones to text message during class time, and 10 percent admit that they have texted during an exam on at least one occasion. When first introduced, many teachers saw iPhones and Android devices as distracting threats, and schools chose to ban them entirely or limit their usage to hallways and outside the building. But as education apps were developed, educators began to see that they could be used as teaching aids—including having students program their own apps. 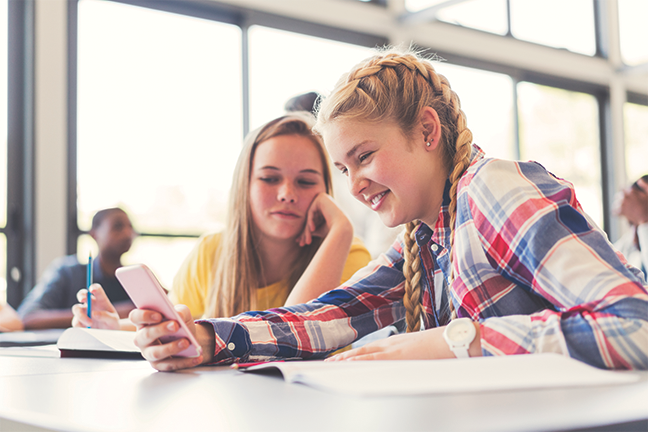 Districts began to think that judicious use of phones for classroom research could engage students who have grown up with technology in the palms of their hands. After all, when the smartphone in your pocket is many millions of times more powerful than all the computers used to send man to the moon, it makes sense to use it to full advantage. At the same time, the BYOD movement began, allowing students to actively use mobile phones as learning devices in school. Soon, there was no shortage of websites that offered tips and guidance on how teachers can effectively use smartphones in the classroom. And, with the ever-present threat of emergency events at schools, many parents want to contact their children throughout the day, so early smartphone bans were relaxed to allow the devices in the classroom. Last month, for example, Sarasota County Schools in Florida began to move away from a ban on cellphones in schools. School leaders will propose letting students have phones in their bags, but not visible during class. A recent survey from the National Center for Education Statistics shows that the percentage of public schools that banned cell phones and other mobile devices dropped from nearly 91 percent in 2010 to nearly 66 percent in 2016. Supporting such observations, a research study published last summer seems to prove that smartphones and mobile devices contribute to cognitive distraction. The study, conducted by Rutgers University Psychology professors Arnold Glass and Mengxue Kang, split a group of 118 college students into two groups. Each group was taught the same material by the same instructor, in the same classroom at the same time of day. One group was allowed to have smartphones or other mobile devices open during class, while the other wasn’t. The researchers report that the group that had the devices scored, on average, a half-letter grade lower on exams, which might be the difference between passing and failing in some cases. Students who didn’t use a device but were in the same classroom with those who did also scored lower, apparently due to distraction from surrounding devices. Schad joins District Administration as chief information and innovation officer. There are successful transition plans and then there are successful transitions for special ed students. Experts offer ideas.